Pastor Ken Smith (Rev. Dr. Kenneth W. Smith) is passionate about helping people to know God’s great grace and love through knowing and following Jesus Christ. Ken relates comfortably with people and has a down-to-earth, humorous, and conversational style of biblical teaching and preaching that engages and inspires. Ken believes that God offers hope, forgiveness and new life to anyone who responds to Jesus in faith through the cross and the Holy Spirit and His power. In addition to serving as a pastor for 28 years, Ken has worked as a laborer and in elder services case management. He was born and raised in the Boston area, and received his calling to pastoral ministry around the age of sixteen. Later he attended Gordon College, where he majored in Biblical and Theological Studies and minored in English, History, and Philosophy. He received the Master of Divinity (MDiv) degree from Gordon-Conwell Theological Seminary and his Doctor of Ministry (DMin) degree also from Gordon-Conwell, with a focus on preaching and his thesis on preaching from the Psalms. In 2013-2014 Ken completed a chaplain residency at Bridgeport Hospital in Bridgeport, CT, mediation training, and leadership training through the Nehemiah Leadership Institute of the American Baptist Churches USA (ABCUSA, www.abc-usa.org). Previously, Ken and members of First Baptist Church of Shelton participated in the ABCUSA’s Missional Church Project. Ken believes that God is using all of this recent experience to deepen his understanding, compassion, and leadership skills in ministry. In 2003, the Evangelical Homiletics Society recognized Ken with the Willhite Award for his paper “Preaching the Psalms,” which showed how pastors and teachers can use the inspired design of the Psalms to help draw people closer to God. The paper later was published in an edited version as the article “Soul Sermons from Psalms” on www.preachingtoday.com, and in the book Interpretation and Application, from The Preacher’s Toolbox Series, Vol. 3, from Hendrickson Publishers. Bicycling and archery are two of Ken’s favorite hobbies. He also enjoys football, volunteer construction projects, hanging out in local venues for coffee and good conversation with local people, teaching the Bible, reading, writing, leading discussions, designing creative worship, building community, and of course spending time with his wife Elisabeth and their families. Ken and Elisabeth have been married for 26 years. 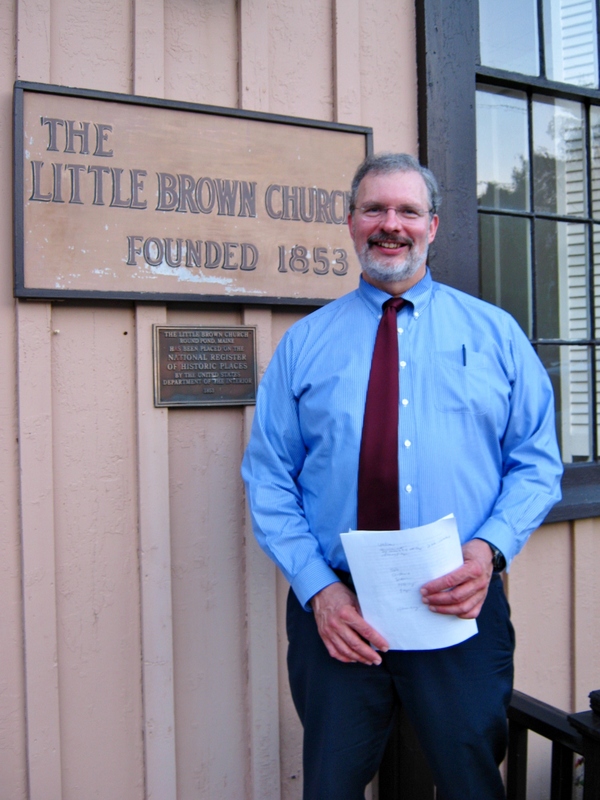 In 2015 Ken began serving part-time as chaplain at Bristol Hospital in Bristol, CT. He has also served as board president of a large soup kitchen and food pantry, as a member of the Shelton Clergy Association, and as a volunteer for the American Baptist Churches of Connecticut’s (abcconn.org) Commission on the Ministry and the Connecticut chapter of the ABCUSA Ministers Council (www.ministerscouncil.org). From 2007 to 2010 Ken served as president of the ABCUSA Connecticut Ministers Council. Photo: Pastor Ken Smith at a favorite chapel in Bristol, Maine.